Prescription medicines are often distinctively shaped and colored to differentiate themselves from other brands or to indicate dosage. This actually has the beneficial effect of cutting down on mistakes while dispensing medications. Some patients even organize their multi-drug regimen by color or shape ("I take the green pill with lunch, the blue and white one at 6 PM and the little red ones at bedtime") Since medicines are often dispensed in identical bottles, it can be argued that this is one instance where easily identifiable, bright colors are desirable and worth a small bit of artificial color. Please note - on this page we list the manufacturer's specific brand name for a product containing Red Dye #40 as part of the formulation. 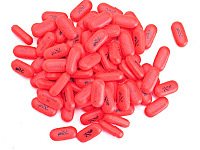 There may be generic versions of the drug that are differently colored.